I missed food trip Friday, this dramatist here has been dumped with piles of dead processed trees to check and review, that even my food blog was sent for adoption. Anyway, I’ve been missing a lot of Jessica Zafras these days; I wonder why we shifted newspaper subscription in the office. But right now I’m creating a new space for stuffing my stomach; I think it wouldn’t be that bad having tea and cookie with this spectacled lady along with Karl Marx, Sun Tzu and now Delai Lama. Nyahahaha, am I having too much of these people? How I wish I can have a tea and cookie with them… in my imaginings. a cookie and a tea? sounds perfect! Happy FTF! Buti na lang di pa nakain lahat kundi tigok ang FTF lol..
oh, jeezzz, would u include nelson mandela's, and martin luther king's into that readings, mam vernz, hehe. cookie and tea are perfect combination for snack...yum! Weeeee!!! 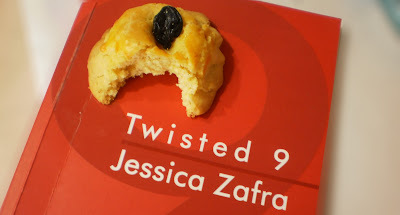 may Twisted 9 ka na, ako wala pa. hahaha. Hmmmm... Jessica Zafra, makabili nga nito at enjoy ko rin reading with tea and cookies..Hehehe gaya-gaya Ate Vernz. mwah! you prefer tea from coffee? bakit naman half nalang natira dyan!!! !